“FRIENDS PROPERTIES” the ISO 9001:2008 Certified Real Estate Agency, is one of the leading Real Estate Agency based in Goa. Mr. Ramesh Tiwari is the proprietor of this Real Estate Agency. We at Friends Properties offer comprehensive Real Estate services & conveniently facilitate all type of property related requirement i.e Sale, Purchase, and Rental of Residential / Commercial / Industrial / Beach Properties in Goa. Furthermore, we identify and comprehend the needs of our customers and subsequently help them to find suitable homes & properties by getting faster and easier solutions for property related matters. We offer a variety of properties ranging from a basic apartment to a luxurious villa / bungalow or a plot with beautiful view. 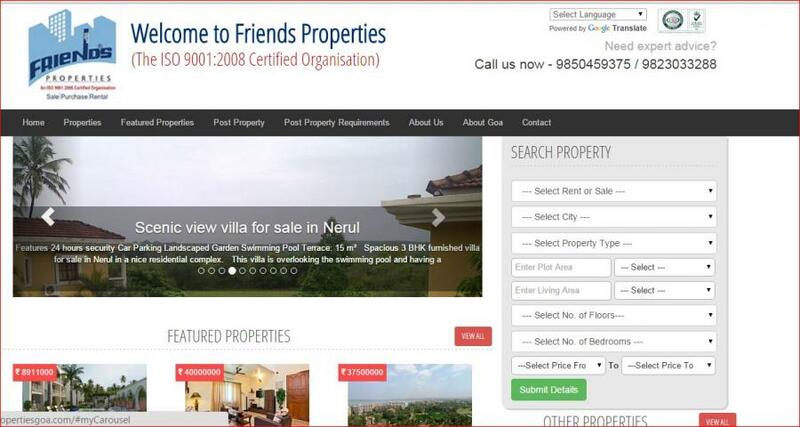 Friends Properties acts as a bridge to connect property buyers and sellers. We at Friends Properties will not only find a customer for your property but also be by your side till the registration of sale deed. With 25 Years of Experience, whether you are looking to Buy, Sell or Lease your property… We provide a total solution for all your Real Estate requirements….. Your dream home is just a call away………….. We can Help! Note: We would be charging a 2% commission of the total value in case of sale / purchase of the property and one months rental in case of renting your property / acquiring a rented property for the services offered by us.